My passion for music began when I was around thirteen years old! 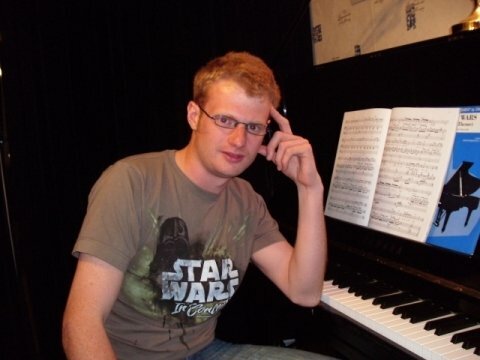 I had just seen the movie STAR WARS and was so inspired by the music I used my brothers keyboard to work out the theme tune from the films and this was where my love and passion for music really began and has grown stronger each day since. I went on to study the piano professionally and gained grades in both practical and theory and in 2006 I contained my studies at Queen Mary’s College and gained a BTEC National Diploma in music practice. I took a keen interest in composition and performance and have composed and performed music for several theater productions and I am currently co writhing and arranging the music for a musical. I tutored a boy at GCSE level back in 2005 for around three months before going to college where I had to end tutoring as my studying took all my time, but I feel that he learnt a lot in that time, It was educational for both me and him and I had a lot of fun with it too! My main ambition is to make the lessons fun, as I believe music to be a subject that most people study because they want to rather than have to! My lessons are very much for the individual, whatever level or style of piano you want to learn I cater for all! There will be no strict syllabus just what you as the pupil want from the lesson. I consider myself to be good with people and have the passion and knowledge to make the lessons fun as well as educational.